PieSync Help Center - Why am I seeing "Authentication failed"? All Categories ​>​ FAQ ​>​ Why am I seeing "Authentication failed"? ... or somewhere along those lines. Specifically, changes to the account credentials (e.g. changing the password) may be a deliberate safety measure, but naturally, this will prevent PieSync from accessing the contact data any further. Therefore, you need to re-authorize your app for PieSync to be able to read & write to it. 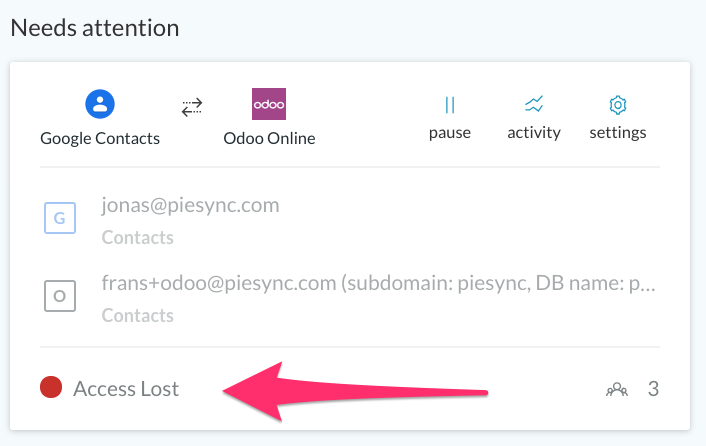 The PieSync connections tab provides an overview of your connections. The ones that need attention will be presented on top. A dropdown list will appear after clicking the connection box, allowing you to reauthenticate the account. If this is not working, try to remove the connection completely and set up a new one. How can I access the PieSync platform?